You have probably experienced having an uncomfortably dry mouth, rough hands, or dull skin even while inside your workplace. Both cold air from air conditioning and the heat can affect your respiratory system and cause mild discomfort. The effect is less productivity at work and sometimes annoyance at home. While bulky humidifiers can aid in relief, not everyone has access to a roomy office space or house. What’s the best solution? Simply drop a USB Doughnut Humidifier into a bowl or glass of water! The user-friendly USB Doughnut Humidifier is a tiny and lightweight round device that has a 1-meter USB cable. 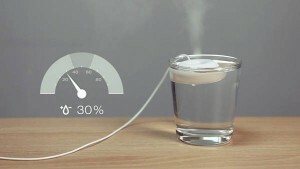 To start using, simply plug the doughnut humidifier cord into the USB port on your laptop or computer and place the USB in any small container of water (since it doesn’t need an attached water tank, and yes, any kind of water will do!) The doughnut USB will float on the water surface and generate pleasantly cool and moisturizing vapors via ultrasonic waves. As the waves create a mist of water, it helps relieve dry eyes, skin, mouth and throat. It takes only a few minutes to relieve you from the usual discomfort of the heat. The sleep timer switch allows users to leave their USB unattended. But this feature is most useful when you are about to take a quick nap or when you’re about to snooze off for the night. Just place the USB Doughnut Humidifier on top of your office desk or on the bedside table. You can have quality sleep without worrying about leaving it turned on for some time. If you are a traveler, the very portable USB Doughnut Humidifier has a diameter of only 50-mm and is guaranteed lightweight, making it ideal to bring along during vacations or business trips. Safe and convenient, the USB doughnut has been creatively designed to bring you comfort and affordability at the same time. For only $16, you can choose from blue, white and pink color options. Personally, as I am nose deep in seasonal allergies, having this at my desk would be exactly what I need. And this is perfect for an office, because it is so small and fits in a cup of water, it will easily sit near, but not too close to my computer – in case I spill. Also, make sure you keep the doughnut out of children’s reach and tell them early on that that the USB-powered doughnut is not edible! 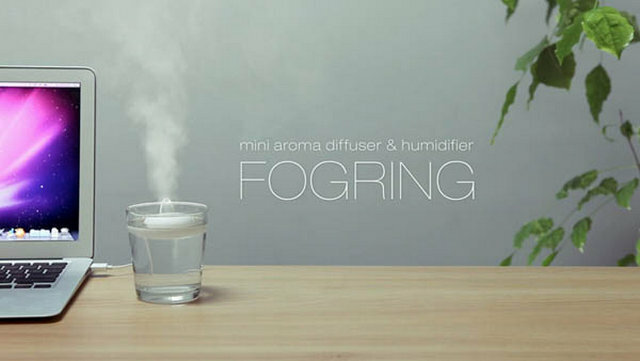 This entry was posted in USB Gadgets and tagged Doughnut Humidifier, USB gadget, USB Humidifier. Bookmark the permalink.